Nelson Mandela (1918-2013) stood steadfastly for equality and justice, while opposing intolerance, hatred, racism, apartheid, ethnic cleansing and genocide. Mandela’s father, a tribal chief in Transkei, a Xhosa homeland, gave his son the name Rolihlahla at birth. In Xhosa it means "pulling the branch from a tree" but colloquially it means "troublemaker." Mandela's father may have had a premonition of troubles to come, as his son would one day be called the "Black Pimpernel" because of his ability to elude political police by donning disguises (his favorite disguise was a chauffer). At age 16, Mandela was formally initiated into manhood through a traditional Xhosa ceremony in which he was given the name Dalibhunga, which means "creator or founder of the council" or "convener of the dialogue." When using the name to greet Mandela, the correct usage was "Aaah! Dalibhunga." Later in life, Mandela was known as Madiba, the name of his Xhosa clan, as Tata ("father") and as Khulu, a Xhosa abbreviation for uBawomkhulu, which means "grandfather" with connotations of "great, paramount, grand." After spending 27 years in prison for resisting apartheid, Nelson Mandela became the first black president of South Africa and a Nobel Peace Prize laureate. Nelson Mandela was a poetry lover, and he loved one poem in particular: "Invictus" by William Ernest Henley. "Invictus" became the title of the movie about Mandela's life; it starred Morgan Freeman as Mandela. The inspiring poem appears in full later on this page. was more powerful than a nation of unjust jailers. he refused the comfort of a coward's sinecure. A man must belong to his pride, and so too every freedom-loving woman! transforming himself into enlightenment and benevolence. cringing in obedient silence before their inferior masters. It gets in the way of strategy. on the way people live and die. for my long walk is not ended. he would not let us shirk. and make them its pawn. If you are a student, teacher, educator, peace activist or just someone who cares and wants to help, please click this link How Can We End Ethnic Cleansing and Genocide Forever? and do what you can to make the world a safer, happier place for children of all races and creeds. Whether that comes from nature or nurture, I cannot say. a desire to fight the system that imprisoned my people. and could not do otherwise. hoping it will kill your enemies. I’d still be in prison. There is no such thing as partial freedom. one armed with the hope that he will rise even in the end. but to use methods that mirror those of the oppressor. At a point, one can only fight fire with fire. ―Nelson Mandela, "Long Walk to Freedom"
Nelson Mandela is my hero. His story has come to symbolize the struggle against the apartheid machine in South Africa. Apartheid, the terrible, and often violent, institutionalized racism that for so long held South African society in its grip, was not an easy policy to fight against—especially since he was oppressed within the system. Mandela understands what it means to fight against enormous odds; he went to prison for nearly three decades for his work, because he knew there was no alternative. He believes that every human being is of equal value. Mandela is my hero because he survived many years of life as a subject of colonialism. As a child in Africa, Mandela was a victim of the European colonial project in that involved "civilizing" indigenous folks by silencing African lifeways in favor of so-called Eurocentric high culture. Perhaps finding his Xhosa name, Rolihlahla, too cumbersome or primitive, a teacher assigned him the decidedly more English "Nelson" when he was a student at a British colonial boarding school. Mandela is my hero because he embraces all people like brothers and sisters. He is one of the greatest civil rights leaders in world history. Mandela is my hero because his spirit cannot be crushed. Imprisoned for his political views in the early 1960s, Mandela refused to compromise his position, which was equality and justice for all people. He sacrificed his own freedom for the self-determination of all South Africans. He is courageous and uncompromising. Mandela is my hero because is a man of great personal honor, strength, and integrity, but he was always fighting for something greater than himself, and that was the freedom of an entire nation. It is painful to imagine that this man, who radiates so much love, who espoused so many truths, could have spent so much of his life in prison. 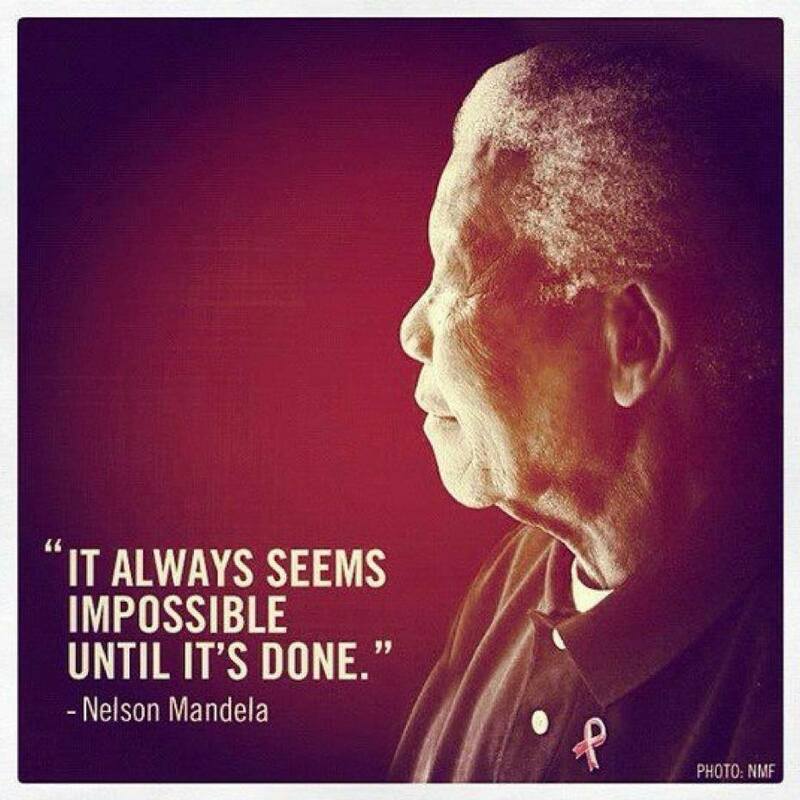 Mandela is my hero because he triumphed over injustice, and not in a small way. Almost unimaginable just a few years before, Nelson Mandela became the first democratically-elected president of South Africa in 1994 and served in that position for five years. More than anyone in the world, Mandela embodies the hopes and dreams of a true, lasting justice and equality, not just for South Africans but for all people. It is Mandela—through his unselfish and constant presence on the international stage raising awareness about AIDS, peace, debt relief, the environment—who most inspires us to think responsibly of our fellow man and of our planet. Nelson Mandela has always inspired me to think beyond myself, to think of people in the wider world as part of a common humanity. I am blessed by his friendship. I love him for what he has accomplished, for what he has been through, for his journey forward. He remains a hallmark of what it really means to give of oneself selflessly—which is, indeed, a gift for us all. Today the world, black and white, recognise that apartheid has no future. In South Africa it has been ended by our own decisive mass action in order to build peace and security. That mass campaign of defiance and other actions could only culminate in the establishment of democracy. Thomas, if you follow the polls in Israel for the last 30 or 40 years, you clearly find a vulgar racism that includes a third of the population who openly declare themselves to be racist. This racism is of the nature of "I hate Arabs" and "I wish Arabs would be dead". If you also follow the judicial system in Israel you will see there is discrimination against Palestinians, and if you further consider the 1967 occupied territories you will find there are already two judicial systems in operation that represent two different approaches to human life: one for Palestinian life and the other for Jewish life. Additionally there are two different approaches to property and to land. Palestinian property is not recognised as private property because it can be confiscated. As reported by the Times of Israel: "Indeed, one of Mandela’s first acts as a free man was to visit Yasser Arafat." The article mentions that photos of Mandela embracing Arafat "raised concerns in Jewish communities around the globe." The article goes on to say that: "Alon Liel, who became Israel’s ambassador in 1992, met Madiba merely a few days after taking up his new post in Pretoria. He had told Mandela’s associates that Jerusalem had dramatically changed its South Africa policies in favor of the black community. 'The message [Mandela] sent us was that they will never forget what we did,' Liel recalled. 'The main message was this: ‘We care a lot about the Palestinians. We are on the verge of achieving our freedom, it will not really be complete until our brothers the Palestinians, who fought with us and supported us, will achieve their freedom.’' If Rabin, who had just been elected prime minister, makes peace with the Palestinians, then 'we will judge Israel on that merit,' Madiba told Liel." If you are interested in following in the footsteps of Nelson Mandela, and believe that peace must be achieved through justice rather than violence, please read this short article: The Path to Peace in the Middle East. You can also learn more about what is really happening in the Middle East and how those events led to 9-11 and two fruitless, unwinnable wars, by exploring our Nakba Index. before we reach the mountaintop of our desires. as a sinner who keeps on trying. I have never cared very much for personal prizes. in the hope of winning awards. because they tend to make you see problems from all angles. for the freedom of their people. the better place we so passionately dreamt of. if they are dedicated to and passionate about what they do. and got back up again. and in all its manifestations. and will do so until the end of my days. Here where I live it is Sunday. and the El at a Sabbath rattle. his shoulders, his pajamas which smell of vitamin pills. my life is black and filled with fortune. and I see this Sunday clean. "What have been the fruits of moderation? where there are only two choices—submit or fight. we must succeed, but at what cost to ourselves and the rest of the country? Nelson Mandela, was born July, 18, 1918 in South Africa, where he attended college, became a lawyer, then joined the African National Congress (ANC) in 1944, and helped found its Youth League. In 1962, South African police arrested him for his opposition to the white government and its apartheid ("separateness") policies of racial, political, and economic discrimination against the non-white majority. In 1964, the government brought further charges including sabotage, high treason, and conspiracy to overthrow the government. On June 11, 1964, Mandela was found guilty of sabotage and was sentenced to life imprisonment. A worldwide campaign to free Mandela began in the 1980s and resulted in his release on Feb. 11, 1990, at age 71, after 27 years in prison. In 1993, Mandela shared the Nobel Peace Prize with South Africa's President F.W. de Klerk for their peaceful efforts to bring a non-racial democracy to South Africa. Black South Africans voted for the first time in the 1994 election that brought Mandela the presidency of South Africa. "I am Prepared to Die." Nelson Mandela's statement from the dock at the opening of the defence case in the Rivonia TrialPretoria Supreme Court, 20 April 1964. We had no doubt that we had to continue the fight. Anything else would have been abject surrender. Our problem was not whether to fight, but was how to continue the fight. We of the ANC had always stood for a non-racial democracy, and we shrank from any action which might drive the races further apart than they already were. But the hard facts were that fifty years of non-violence had brought the African people nothing but more and more repressive legislation, and fewer and fewer rights. It may not be easy for this Court to understand, but it is a fact that for a long time the people had been talking of violence—of the day when they would fight the White man and win back their country—and we, the leaders of the ANC, had nevertheless always prevailed upon them to avoid violence and to pursue peaceful methods. When some of us discussed this in May and June of 1961, it could not be denied that our policy to achieve a nonracial State by non-violence had achieved nothing, and that our followers were beginning to lose confidence in this policy and were developing disturbing ideas of terrorism. It must not be forgotten that by this time violence had, in fact, become a feature of the South African political scene. There had been violence in 1957 when the women of Zeerust were ordered to carry passes; there was violence in 1958 with the enforcement of cattle culling in Sekhukhuniland; there was violence in 1959 when the people of Cato Manor protested against pass raids; there was violence in 1960 when the Government attempted to impose Bantu Authorities in Pondoland. Thirty-nine Africans died in these disturbances. In 1961 there had been riots in Warmbaths, and all this time the Transkei had been a seething mass of unrest. Each disturbance pointed clearly to the inevitable growth among Africans of the belief that violence was the only way out—it showed that a Government which uses force to maintain its rule teaches the oppressed to use force to oppose it. Already small groups had arisen in the urban areas and were spontaneously making plans for violent forms of political struggle. There now arose a danger that these groups would adopt terrorism against Africans, as well as Whites, if not properly directed. Particularly disturbing was the type of violence engendered in places such as Zeerust, Sekhukhuniland, and Pondoland amongst Africans. It was increasingly taking the form, not of struggle against the Government—though this is what prompted it— but of civil strife amongst themselves, conducted in such a way that it could not hope to achieve anything other than a loss of life and bitterness. "The time comes in the life of any nation when there remain only two choices— submit or fight. That time has now come to South Africa. We shall not submit and we have no choice but to hit back by all means in our power in defence of our people, our future, and our freedom". I started to make a study of the art of war and revolution and, whilst abroad, underwent a course in military training. If there was to be guerrilla warfare, I wanted to be able to stand and fight with my people and to share the hazards of war with them. Notes of lectures which I received in Algeria are contained in Exhibit 16, produced in evidence. Summaries of books on guerrilla warfare and military strategy have also been produced. I have already admitted that these documents are in my writing, and I acknowledge that I made these studies to equip myself for the role which I might have to play if the struggle drifted into guerrilla warfare. I approached this question as every African Nationalist should do. I was completely objective. The Court will see that I attempted to examine all types of authority on the subject—from the East and from the West, going back to the classic work of Clausewitz, and covering such a variety as Mao Tse Tung and Che Guevara on the one hand, and the writings on the Anglo-Boer War on the other. Of course, these notes are merely summaries of the books I read and do not contain my personal views. It is true that there has often been close co-operation between the ANC and the Communist Party. But co-operation is merely proof of a common goal—in this case the removal of white supremacy—and is not proof of a complete community of interests. Our political struggle has always been financed from internal sources—from funds raised by our own people and by our own supporters. Whenever we had a special campaign or an important political case—for example, the Treason Trial - we received financial assistance from sympathetic individuals and organizations in the Western countries. We had never felt it necessary to go beyond these sources. The lack of human dignity experienced by Africans is the direct result of the policy of white supremacy. White supremacy implies black inferiority. Legislation designed to preserve white supremacy entrenches this notion. Menial tasks in South Africa are invariably performed by Africans. When anything has to be carried or cleaned the white man will look around for an African to do it for him, whether the African is employed by him or not. Because of this sort of attitude, whites tend to regard Africans as a separate breed. They do not look upon them as people with families of their own; they do not realize that they have emotions—that they fall in love like white people do; that they want to be with their wives and children like white people want to be with theirs; that they want to earn enough money to support their families properly, to feed and clothe them and send them to school. And what 'house-boy' or 'garden-boy' or labourer can ever hope to do this? On 11 June 1964, at the conclusion of the trial, Mandela and seven others— Walter Sisulu, Govan Mbeki, Raymond Mhlaba, Elias Motsoaledi, Andrew Mlangeni, Ahmed Kathrada and Denis Goldberg—were convicted. Mandela was found guilty on four charges of sabotage and, like the others, was sentenced to life imprisonment.